Win A Free Extra Thick | FreebieOrBust Freebies! Welcome to the most fabulous online sweepstakes platform! A few clicks are all it takes to become part of the sweepstakes family and enhance your fortune today! 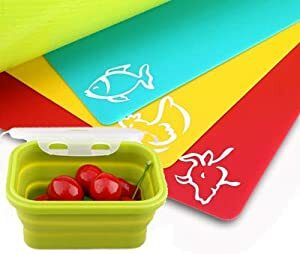 Extra Thick – Extra LARGE – Flexible Plastic Cutting Board Mats for kitchen – set of 4 – Color coded – food icons + Silicone Collapsible folding lunch box container 350ml – LaPomelo (Green). This particular giveaway has a 1:700 chance in winning. Total number of prizes: 2. Giveaway hosted by Amazon and Lapomelo.